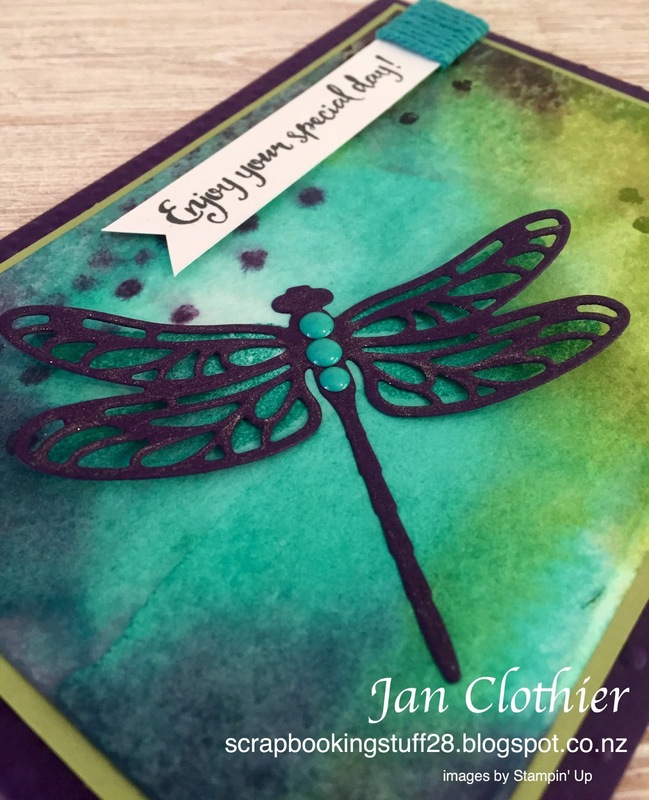 To me, the colour challenge at Hand Stamped Sentiments was irresistible! I love those rich colours and it fell right into my hands as I as experimenting with the newly arrived Dragonfly Dreams (available in the new Occasions catalogue in January). The background of the centre panel is acrylic block stamped. I stamped on the dots in Eggplant and Pear but then wet the Eggplant ones so they bled a little. The card base is embossed using the Softly Falling folder to echo the dots in the panel. The dragonfly die cut is so beautiful that after a lick of Wink of Stella and some enamel dots, little else was needed. Here the embossed card base and the Wink of Stella are easier to see. Update: So delighted to be an Artist's Pick at Hand Stamped Sentiments. Wow! I just received this dragonfly set and haven't played with it yet. Your project is so beautiful and is a wonderful inspiration. Thanks for playing at Hand Stamped Sentiments! Thank you Genevieve. I'm bursting with ideas for this set - it is so fantastic! Beautiful card! You did a great job with your acrylic block stamping. I need to practice as mine does not turn out that way. Thanks for playing with us at HSS. Hope you will play again! I love the beautiful background you created with the colors...it's stunning! Thank you for playing along at HSS! 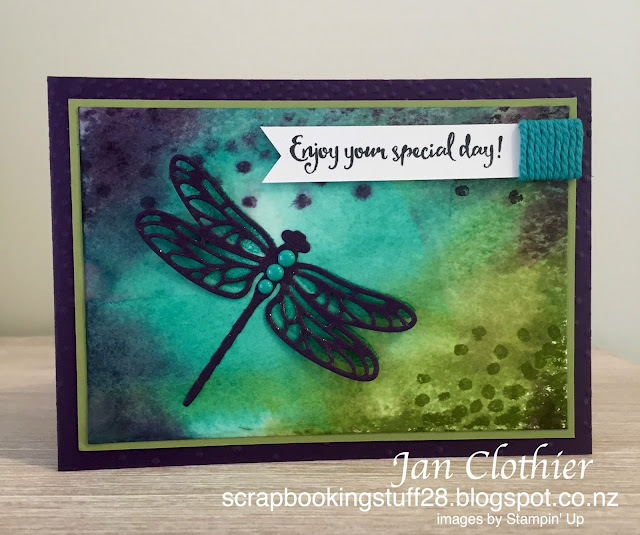 Ohhhh, that watercolored background is gorgeous, Jan! I just love the way these colors bleed into each other! So rich! 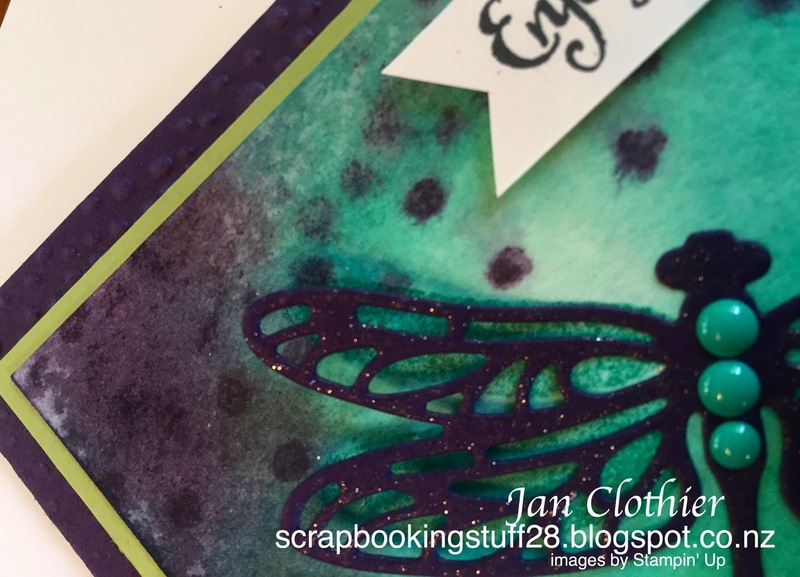 The dragonfly looks so neat with the enamel dots! Thanks for playing with us at Hand Stamped Sentiments.